Today's world is a world connected in every possible way. A world in which real-time connection to live events is so much an every-day occurrence, that we barely notice. Professional products and solutions by Audiozender.nl provide you with a direct connection to a world-wide audience. Make sure you can be heard further than the room you are speaking in. Increase your service level and competitive advantage by offering modern means of audio distribution via the internet. Use a direct audio connection, and our extensive options for re-listening afterwards, recording, automatic archiving, and playback of audio. 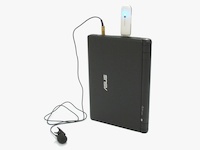 Broadcasting live audio via internet and LAN, recording, and playback: together in one affordable device. Combined with all additional services in a complete solution, fine-tuned to your specific situation. Audiozender.nl is a full-service supplier that does most of the work for you. This makes audio streaming available to the widest audience. Push just one button on the device to start transmitting; click just one link on the webpage to start listening. Learn more about our products and the very wide range of applications they can be used in. For temporary use, see our rental options. Ultimate mobility for broadcasting and recording. No need for ADSL when using 3G mobile broadband (UMTS). With Vodafone 3G (Netherlands), you can now do unlimited broadcasts for just € 16,76 per month -- which is even cheaper than most ADSL subscriptions!